Although there is no clear evidence that the St. Ambroise Entrenchment was ever used defensively, it may have been. Historical documentation indicates that a group of Dakota, led by a man called "The Leaf," moved onto Lake Manitoba in February of 1864 to fish. Early one morning during the last week of April or the first week of May, their camp was attacked by a group of Chippewa (Anishinabe) bounty hunters from Minnesota. Six Dakota were killed outright and several succumbed to serious wounds shortly thereafter. The May 10, 1864 issue of The Nor’Wester reported this raid and noted that the Dakota were "busily engaged in fortifying their present encampment by digging rude earthworks and rifle pits." Although it is not known if the St. Ambroise fortification was built in the spring of 1864, it did exist in 1873, when a "stone mound of Indians" was recorded at this location by William Wagner during his land survey of the shoreline of Lake Manitoba. 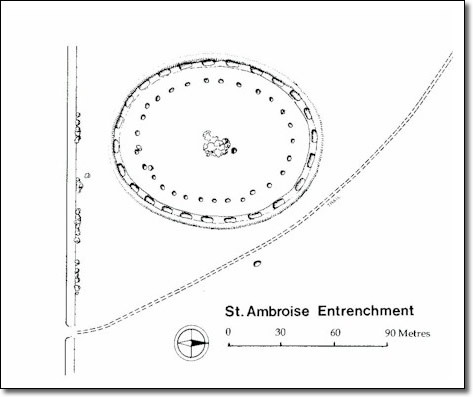 The St. Ambroise Entrenchment is a continuous circle, 114 metres in diameter, containing several interior pits and an earthen embankment around its outer edge. Two circular pits are located outside the entrenchment—a larger one, 64 metres to the northwest, and a smaller one 20 metres to the east. The purpose of these pits is unclear; some have suggested that they were wells or, perhaps, observation posts.